Are you and your program ready? Inclusive early childhood settings are built on a foundation of developmentally appropriate practices (DAP) and consider individualized approaches that benefit all children. Inclusion can look different in different settings but all inclusive settings have some core features. Here are some questions to consider when planning or reviewing your setting. Are administrative policies/procedures supportive of children with special needs? Is your physical environment, including your playground, accessible and does it support play for all children? Do you feel confident about working with children with differing abilities? How are play activities and materials individualized for all children? How do you help children form friendships? How are supportive relationships with families developed? How do you review your teaching practices on an ongoing basis to make sure they are developmentally appropriate and reflect children and family needs? How do you stay up to date with current research and practices that support all children? Highly Individualized Teaching and Learning: An Overview – From the Office of Head Start National Center on Quality Teaching and Learning website. Explore this 15 minute in-service suite for individualized teaching practices. Learn how to enrich activities for children with specific learning needs. Indicators for Quality Inclusive Practice (Field-test Version 1.0) [PDF] – Maine’s Quality Rating System (QRS) called Quality for ME includes global program indicators that define and promote quality in care and education settings. This checklist expands on the current QRS document with explicit indicators that focus on evidence-based practices that support the inclusion of children with disabilities and varied cultural and linguistically diverse populations. The checklist was developed to be consistent with the Early Childhood Inclusion Joint Position Statement of the Division of Early Childhood (DEC) and the National Association for the Education of Young Children (NAEYC) using the defining features of access, participation and support to identify indicators for high quality inclusive programs and services. Child Care Aware – Choosing Quality Child Care for a Child with Special Needs (PDF). (2009). — NACCRRA. A Thinking Guide to Inclusive Child Care: For those who care about young children, with and without disabilities (PDF). (February, 2008). Developed by Disability Rights Wisconsin with support from The Ziemann Foundation, Inc. Supporting Children with Developmental Disabilities (PDF) – Developed by Kids Included Together with funding from the Special Hope Foundation. Connect: The Center to Mobilize Early Childhood Knowledge – Connect has developed web-based resources and modules on effective practices to build early childhood practitioners’ abilities to make evidence-based decisions. Seven modules have been developed: 1) Embedded Instruction; 2) Transition; 3) Communication and Collaboration; 4) Family-Professional Partnership; 5) Assistive Technology; 6) Dialogic Reading Practices and; 7) Tiered Instruction. 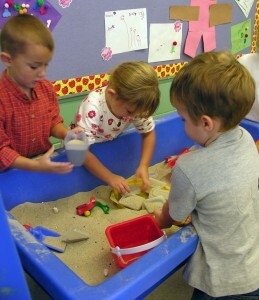 Tips for Early Care and Education Providers, Simple Concepts to Embed in Everyday Routines (PDF). (2013). U.S. Department of Health and Human Services, Administration for Children and Families, National Institute of Child Health & Human Development.